Hi, this is the first of 2 cards I'm posting today. 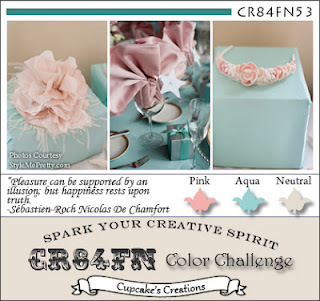 This birthday card is going into the CR84FN 53 Color Challenge. Here's the inspiration graphic that's provided for us. I'm usually not drawn to pink...but I really like this color combination! For someone who's not a "pink girl" I used quite a bit of it on this card, didn't I? I inked up a Cuttlebug embossing folder with some Stampin' Up! pink pirouette ink, then placed a panel of white card stock in it before embossing. I like the letterpress look that it gives the panel! That little crocheted flower is from SU also (discontinued), but I added a few faux stamens to the center before gluing it to the pieces of tulle. I think the rest of the card is self explanatory, but I'll list my supplies below. Thanks so much for taking a look! I'll be putting this card in my Etsy shop later today (there's a link in the upper sidebar of my blog.) If you're reading this post from an email, you'll need to go to the bottom of the email to find the name of my blog. Just click through...and there you are! Soooo pretty! 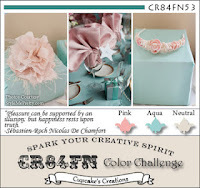 Love the letterpress look on the bg and the texture of the tulle and crocheted flower! Your colors look like you unwrapped the packages in the inspiration picture and placed them on your card - they're perfect! What a soft, elegant look. Susie, I think you should play with pink more often! This is BEAUTIFUL! THX for playing with us at CR84FN! Susie, this is so pretty! I love your whole card but all your fluffy tulle gives it such a soft finishing touch! Beautiful! Oh so pretty! I love the pearly swirl, and the sweet crocheted flower, a gorgeous delicate card! What a beauty! Love the embossed background. Thanks for playing at CR84FN.